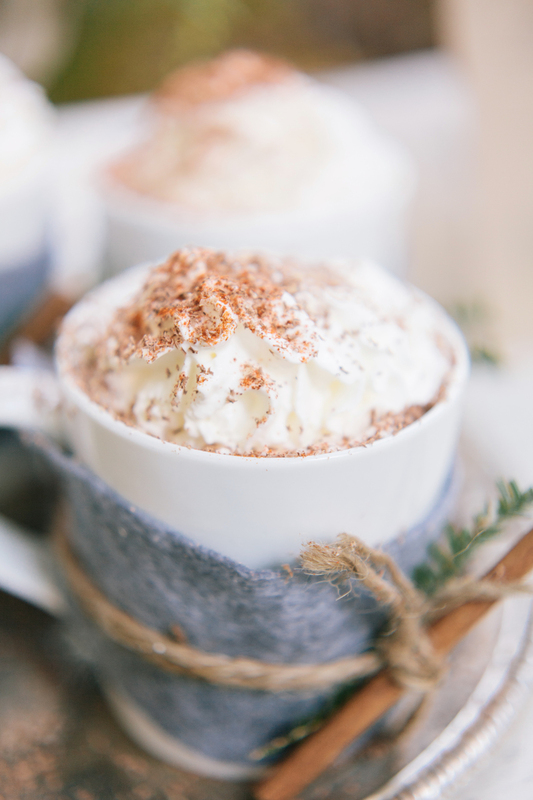 Nothing says winter better than a steaming cup of hot chocolate (especially when it is covered in whipped cream)! 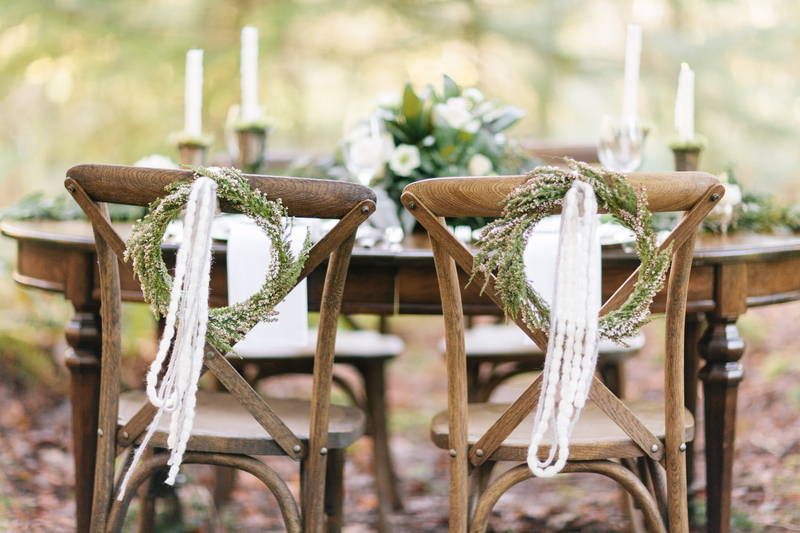 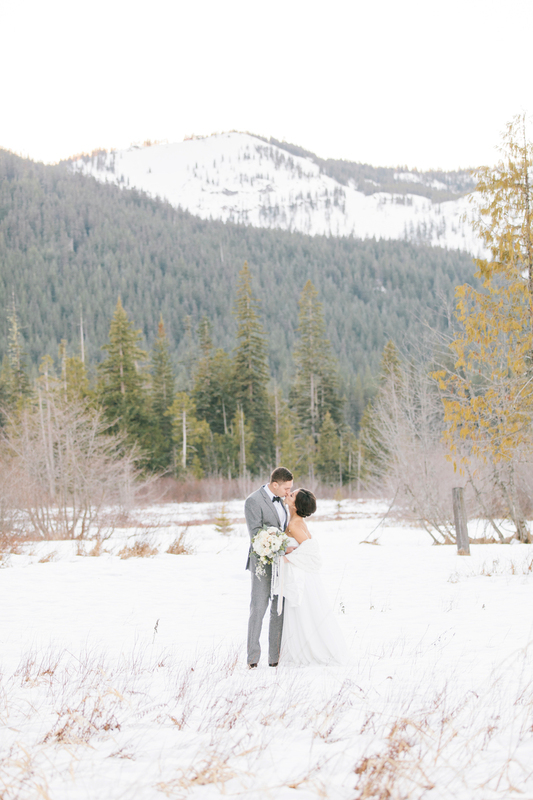 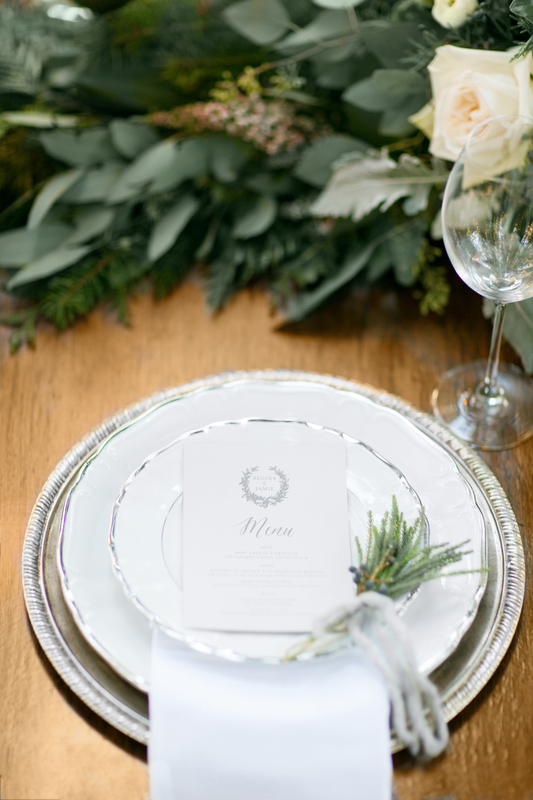 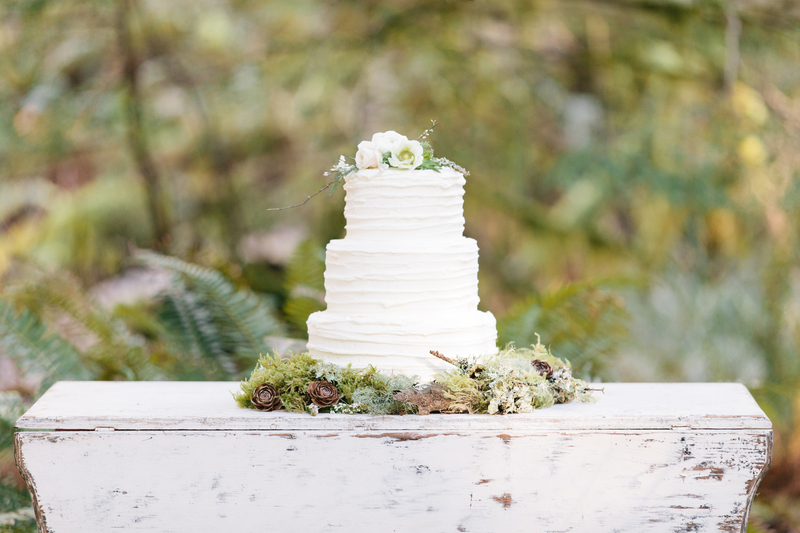 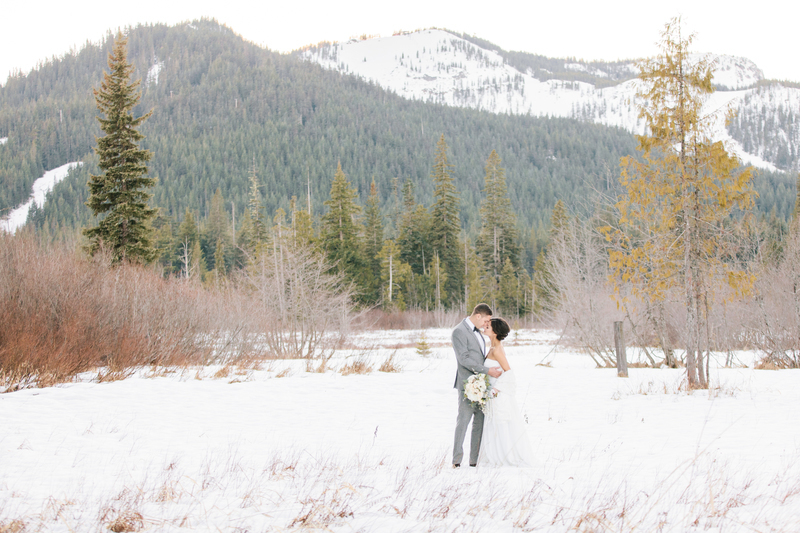 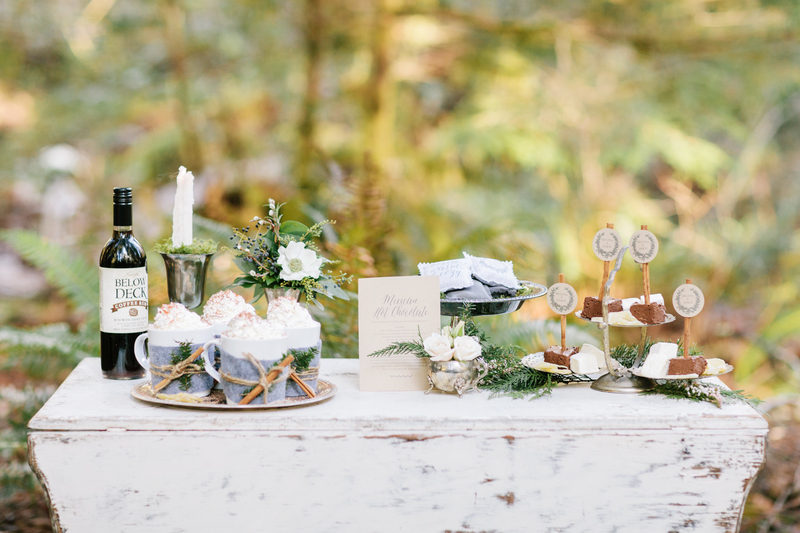 This Chilly Oregon Styled Shoot not only gives us a recipe for Mexican Hot Chocolate, but they also showcase some of the best winter wedding details! 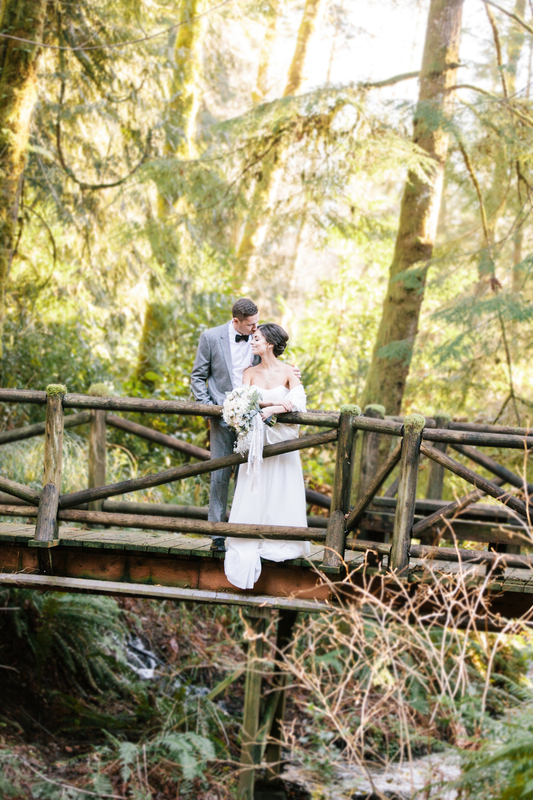 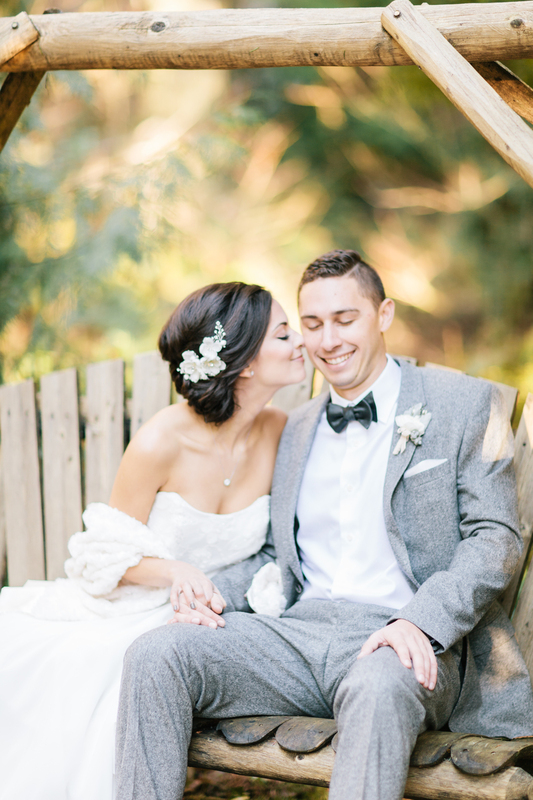 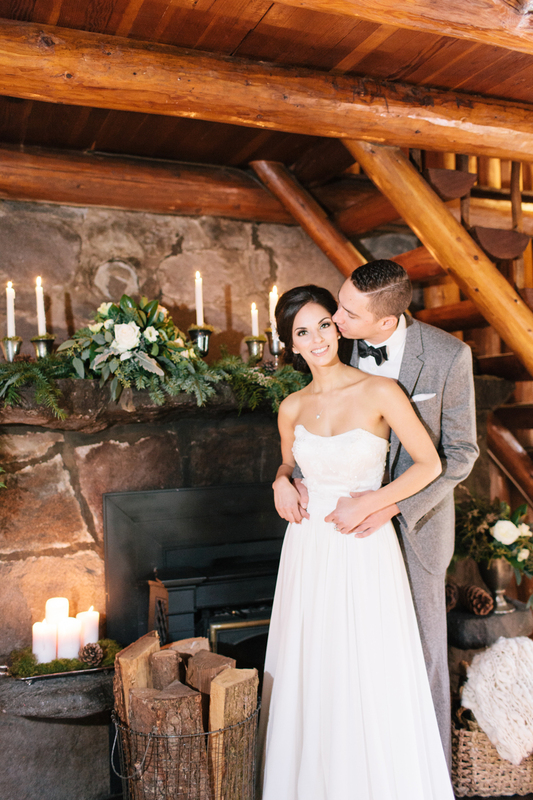 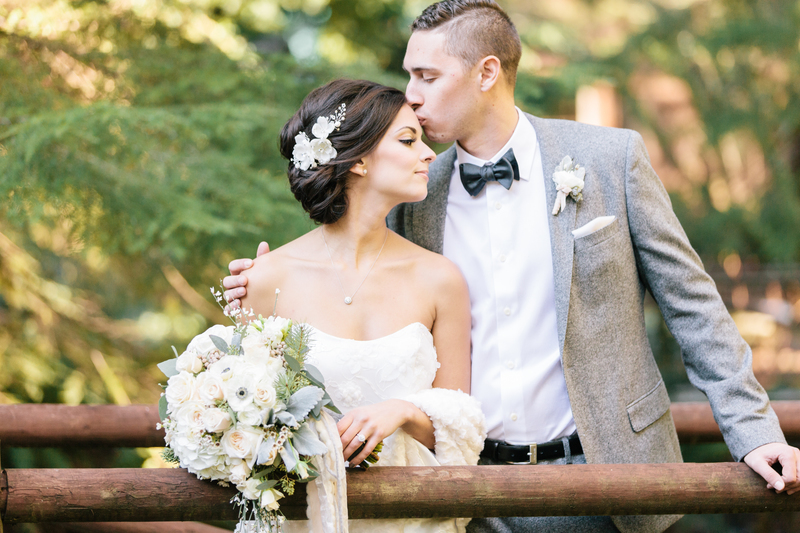 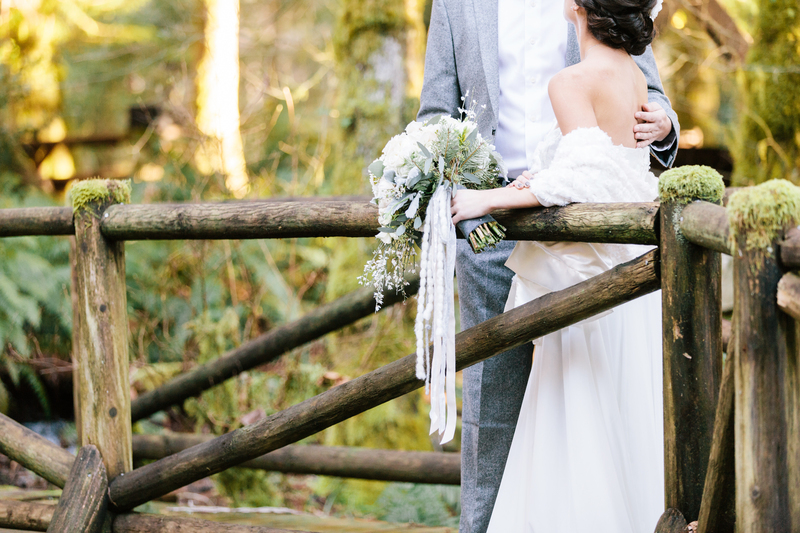 This shoot was captured by Jennifer Fujikawa Photography in the creek-side forest on Mount Hood, as well as in the historic Steiner Log Cabin. 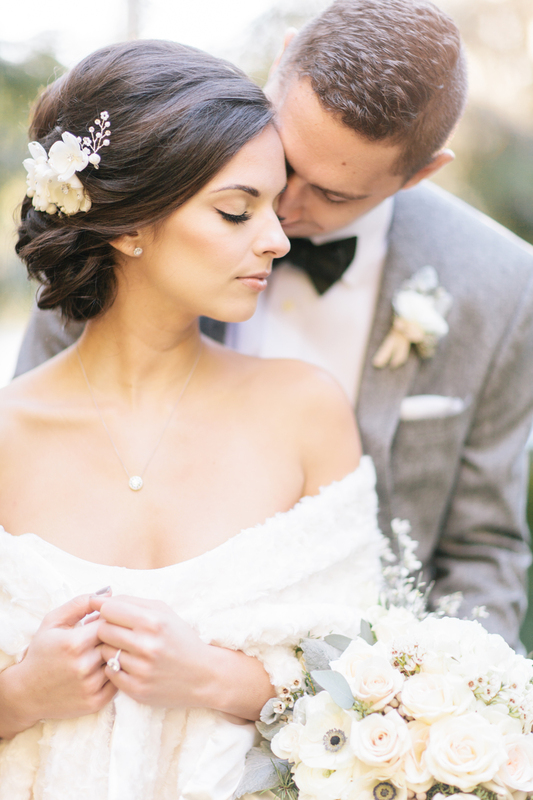 The hints of gold and silver, accompanied with anemones and dusty blue were the perfect choices to showcase this stunning couple (who are actually engaged!) 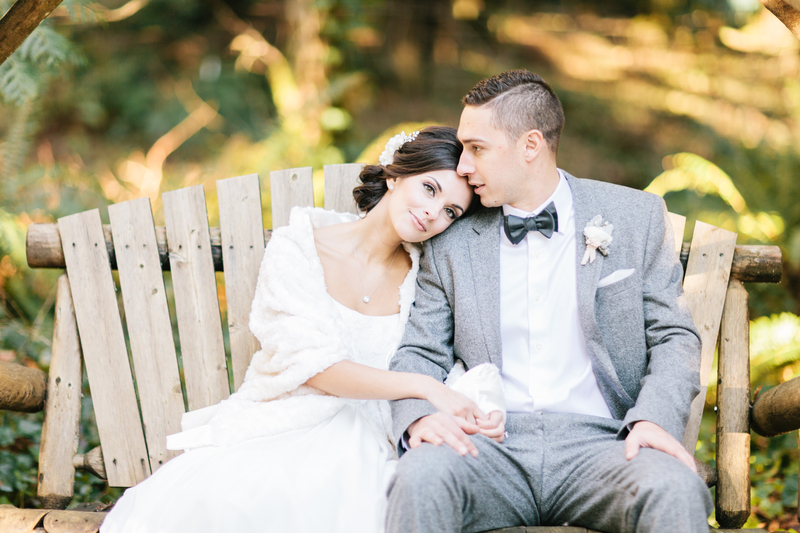 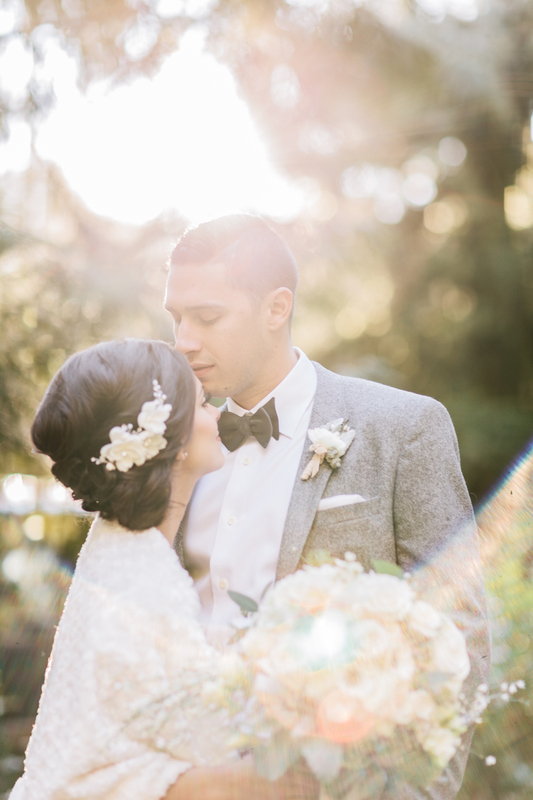 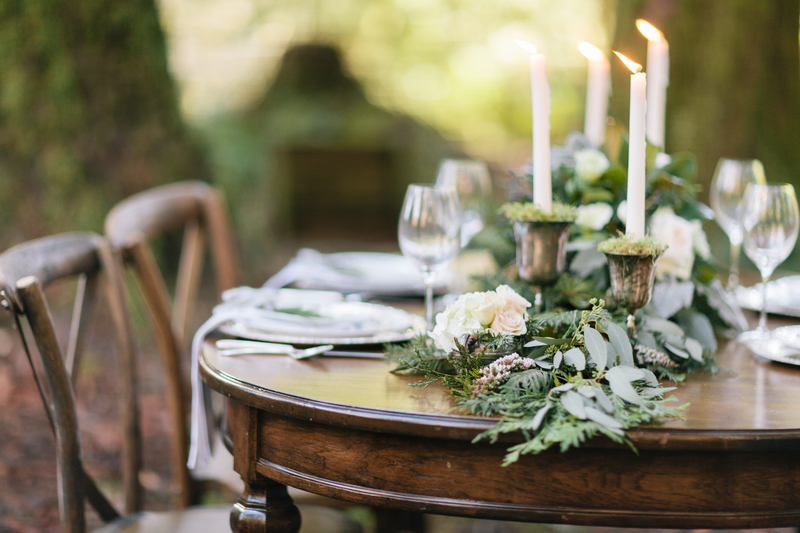 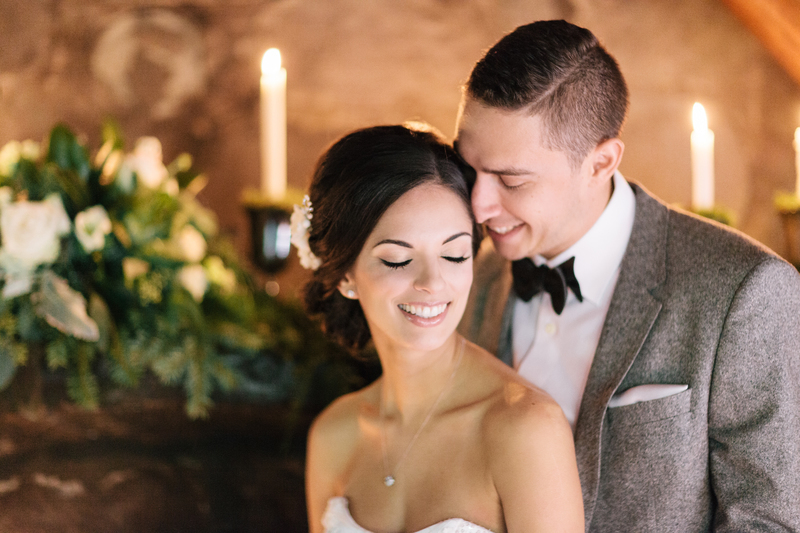 I mean what better way to practice for your wedding day then to be featured in a styled shoot? 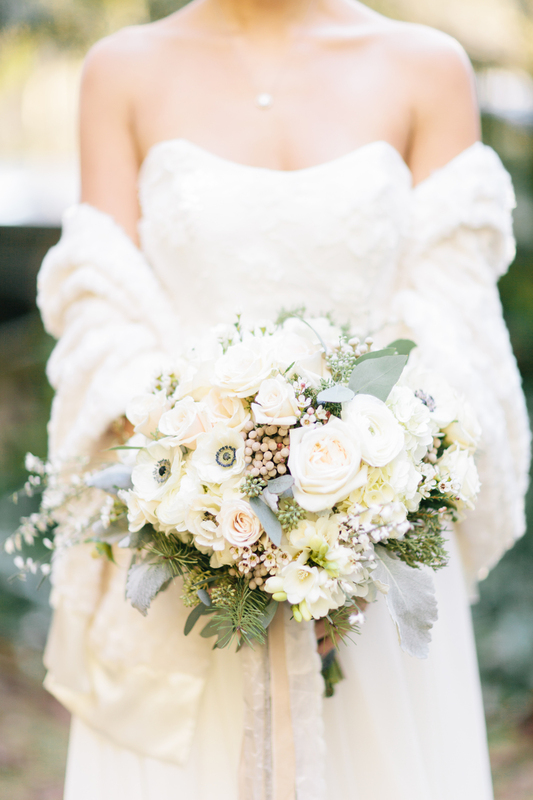 This bridal bouquet, created by Bella Bloom Florals, is a showstopper! 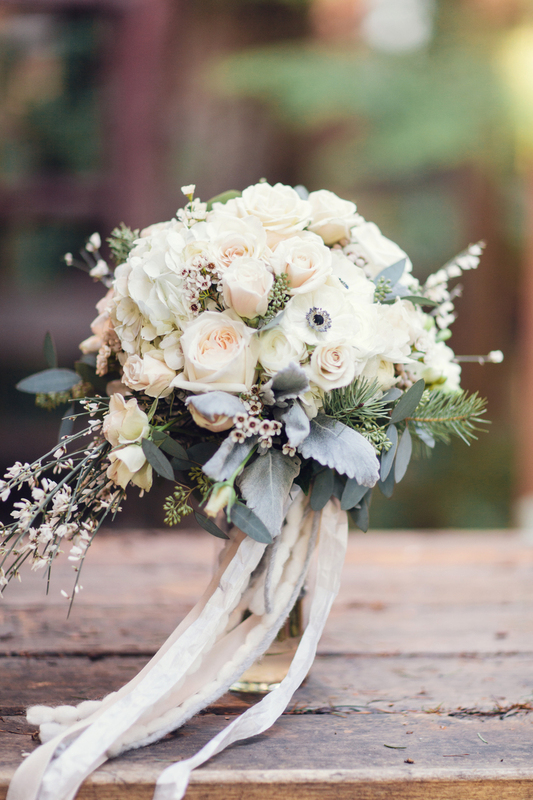 The multiple ribbons add the perfect amount of sassy to this classy bouquet. 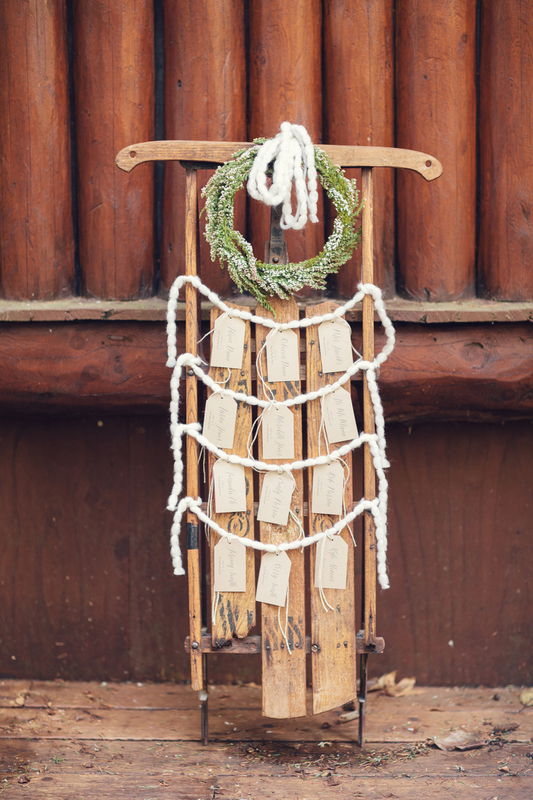 Re-purposing an old winter sled makes for the perfect seating chart! 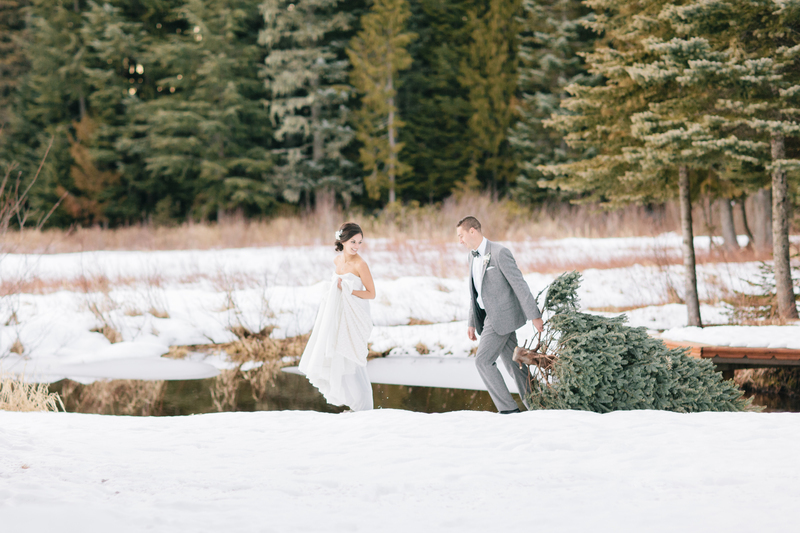 The thick cotton ribbon and calligraphy script dresses the sled up and fits the theme perfectly! 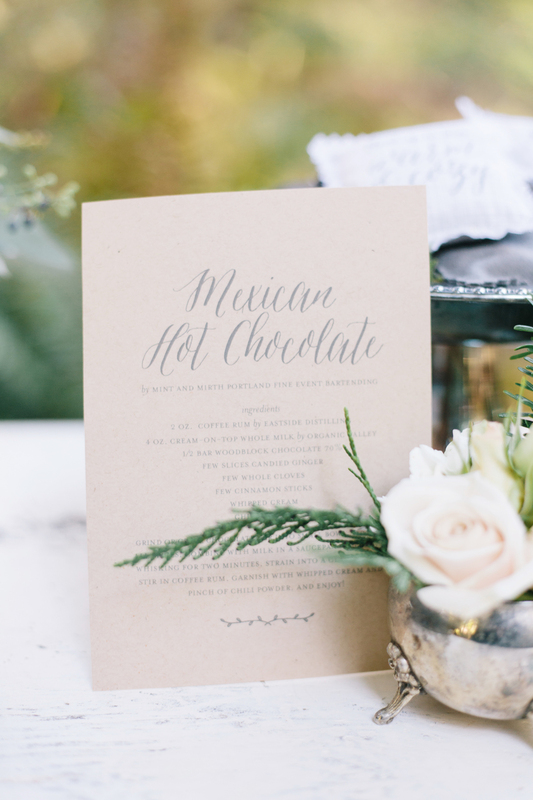 Grind or grate chocolate bar into small bowl, then add all spices. 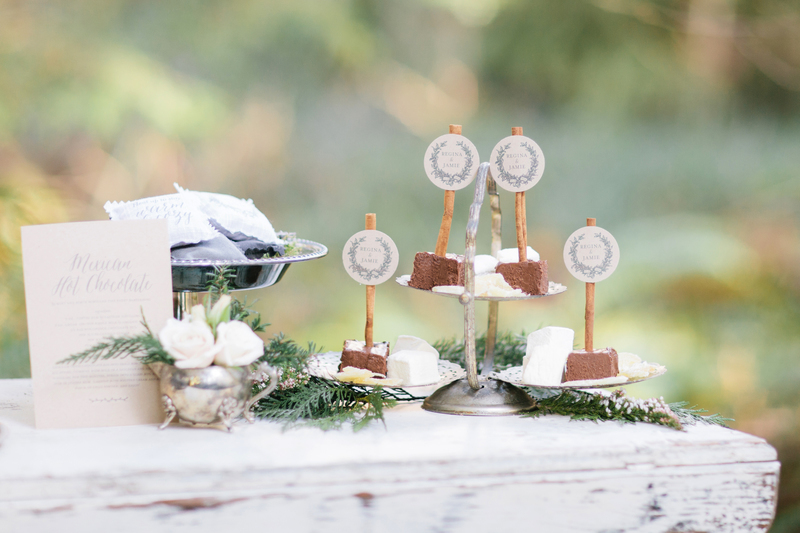 Combine with milk in a saucepan and simmer, whisking for two minutes. 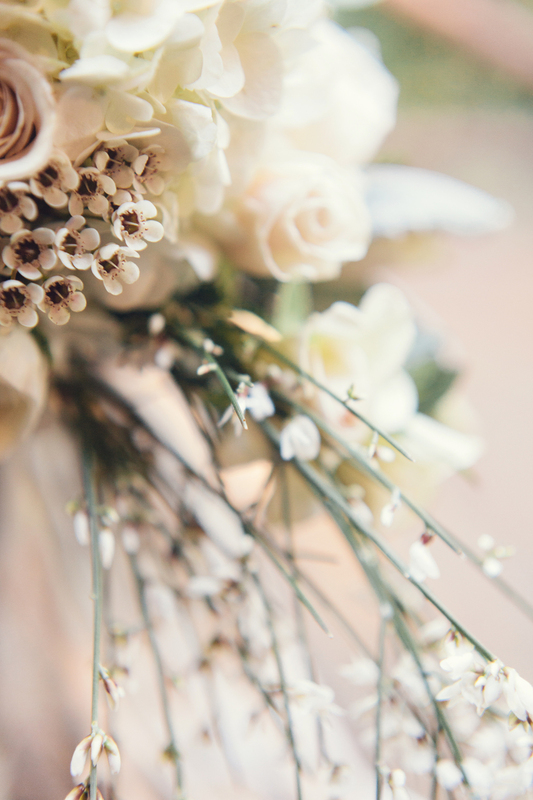 Strain into a glass mug and stir in coffee rum. 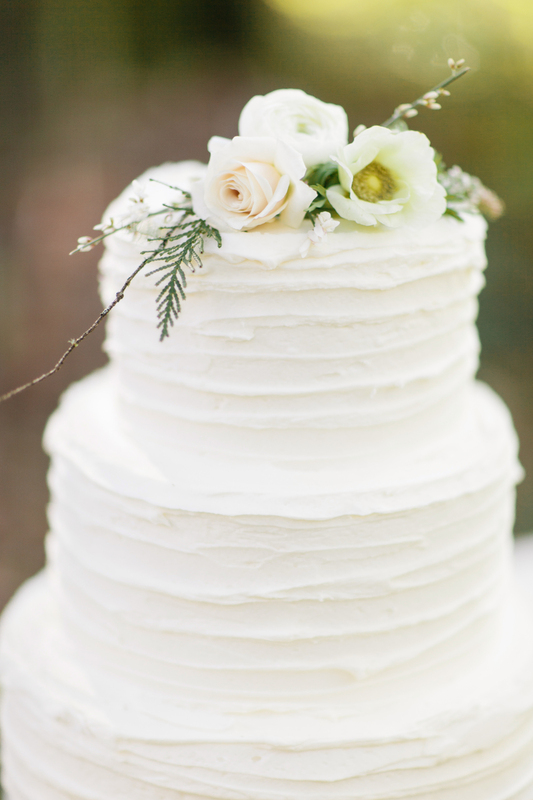 Garnish with whipped cream and a pinch of chili powder, and enjoy! 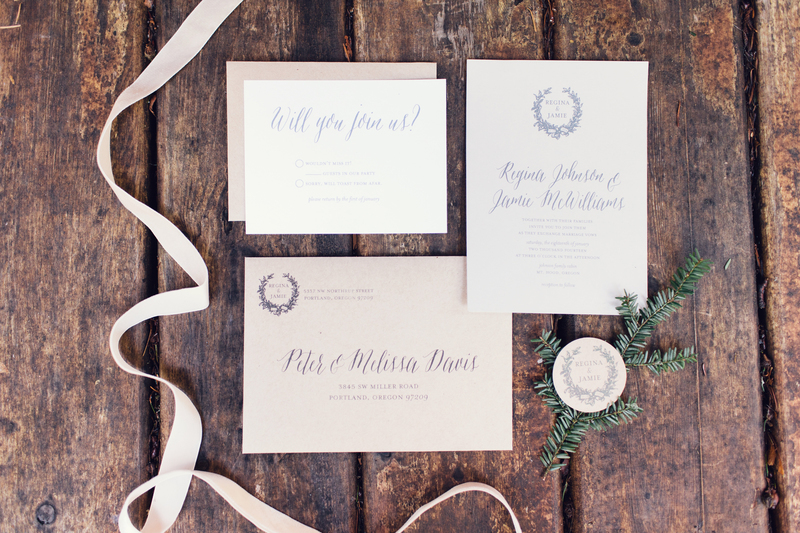 What a great favor for winter party guests! 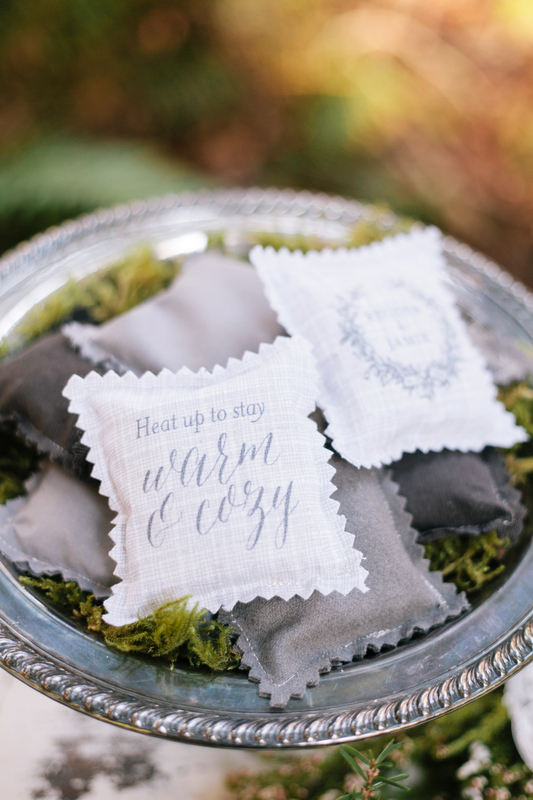 You can never have too many hand warmers to help keep the cold at bay. 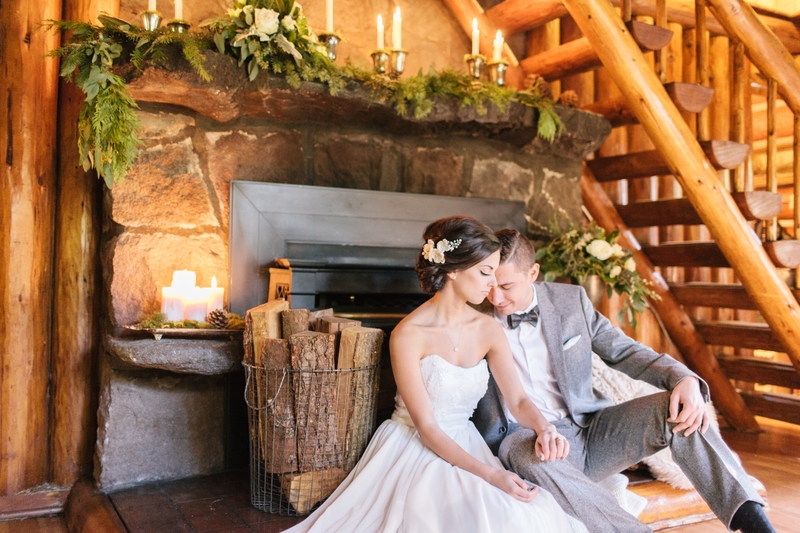 How comfortable and cozy do these two look? 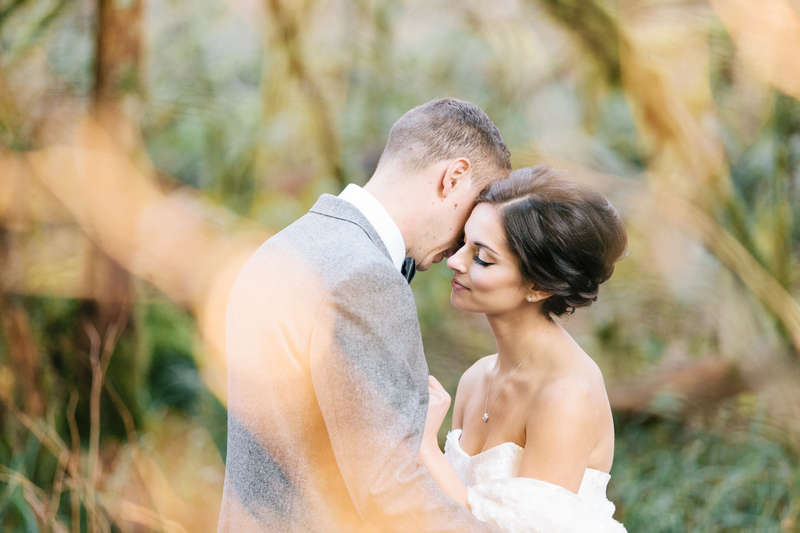 What an intimate moment that clearly showcases their love for each other. 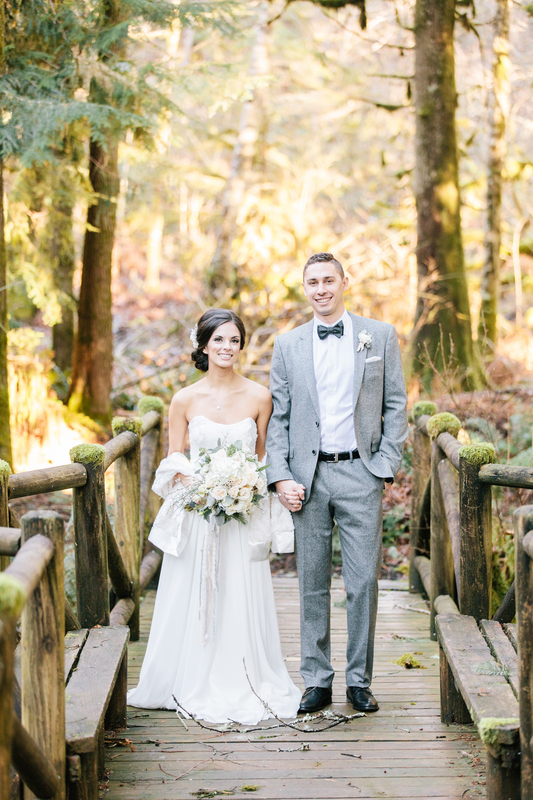 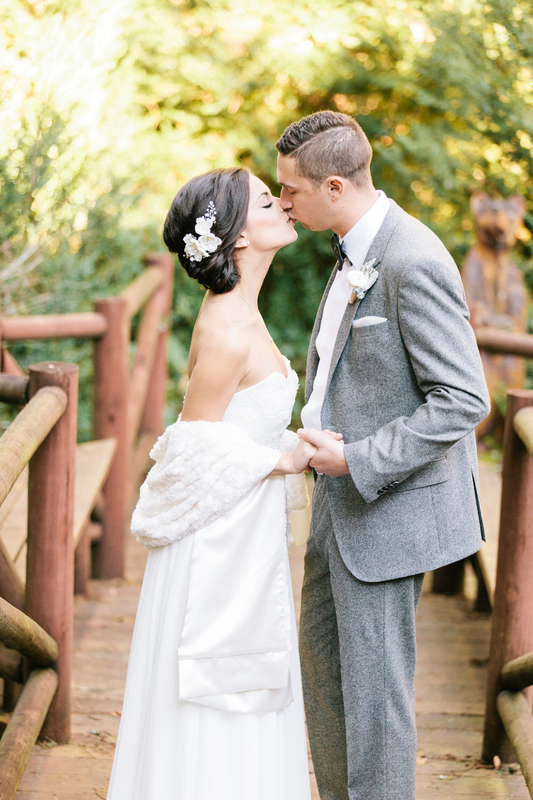 Grey suits are really popular right now, and I love that the grooms suit is classic yet still unique with its flecked pattern. 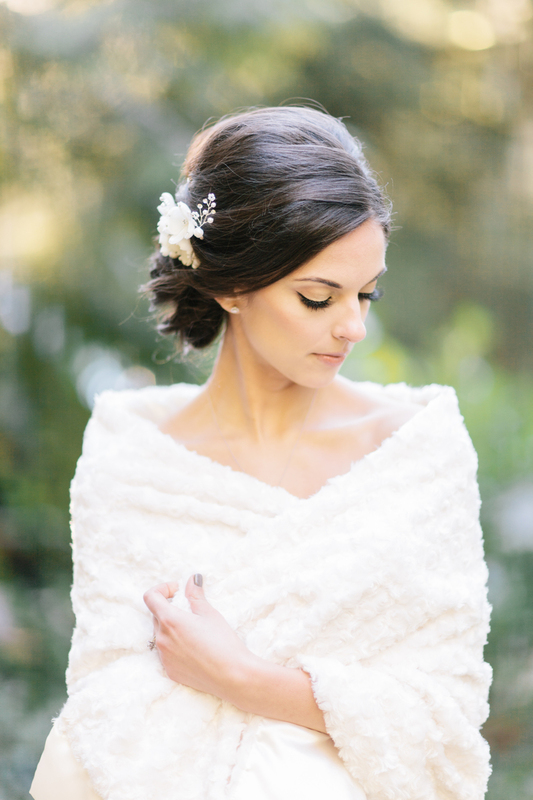 Simple accessories and flawless makeup, perfected by Jein King, really work to showcase this brides natural beauty. 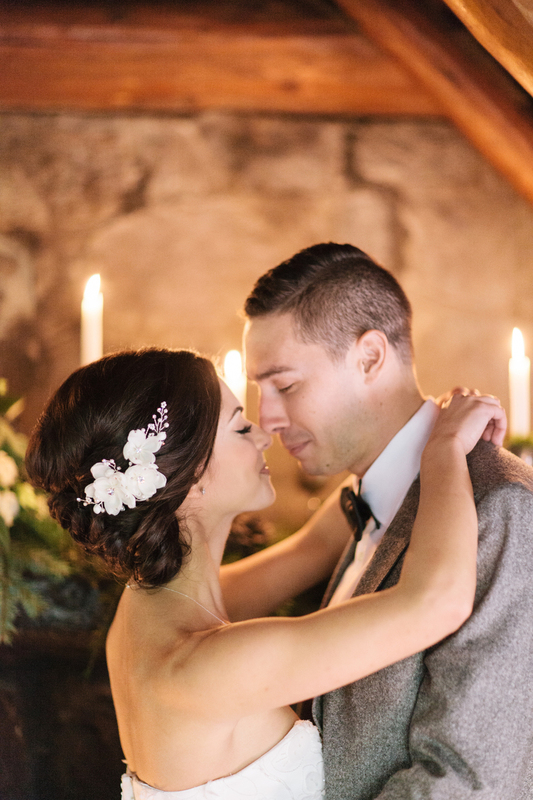 I am obsessed with the brides hair piece by Marisol Aparicio. 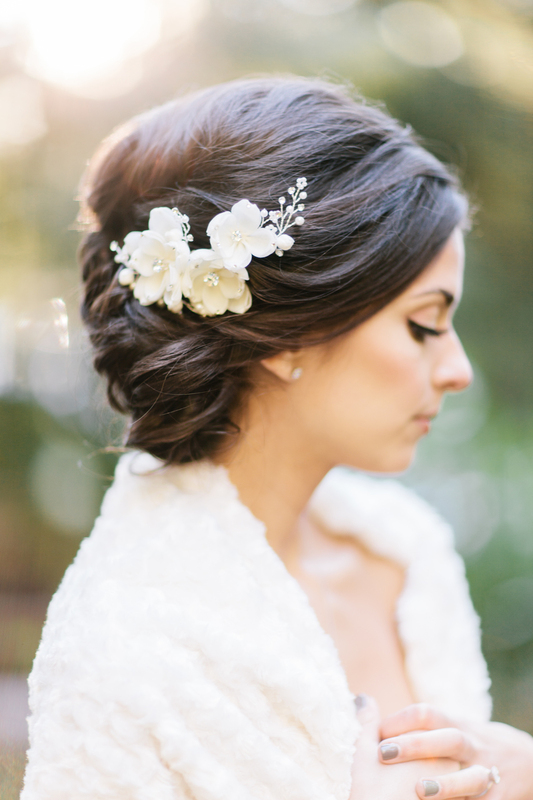 It is simple yet still makes a statement and the contrast of the white flowers on her dark locks is stunning! 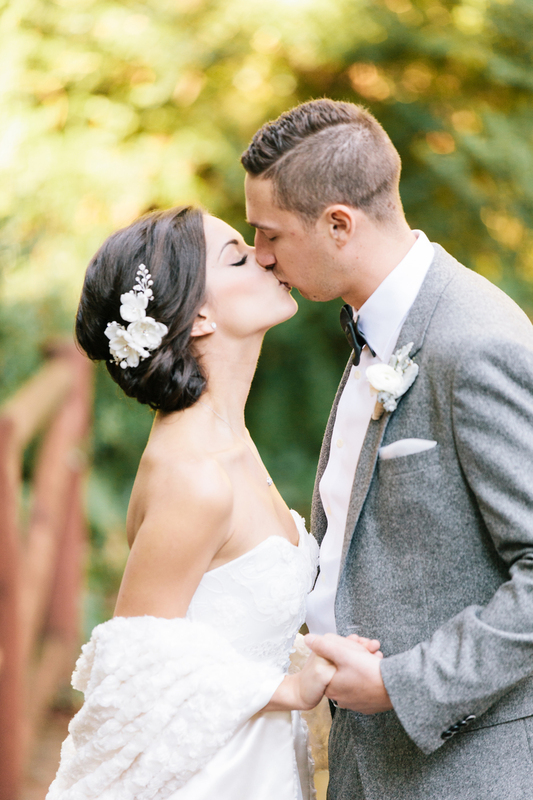 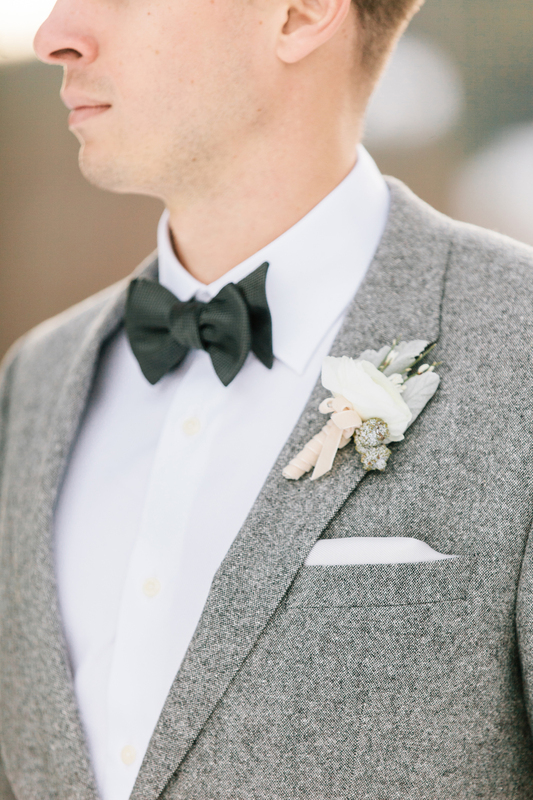 How perfect is this boutonniere? 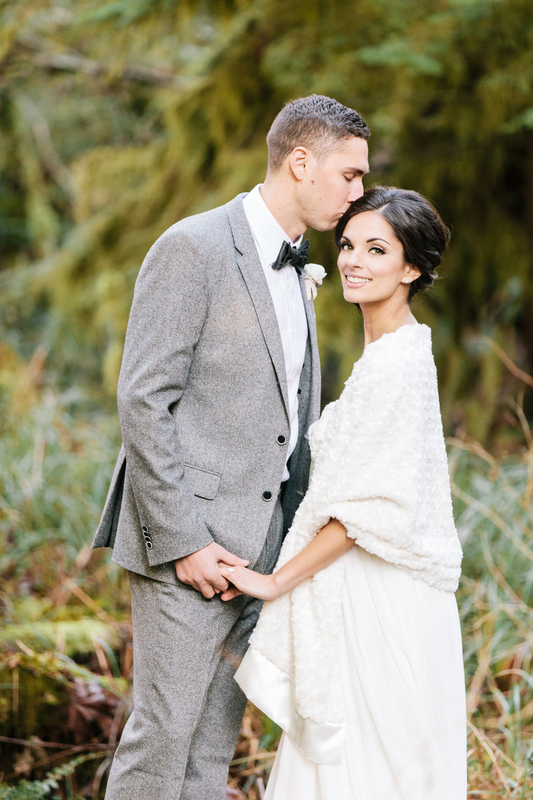 It has just the right amount of sparkle without looking overly girly.